It's always fun to discover the stories readers enjoyed most as the year starts to wind down. The most popular stories with readers in 2016 are a mix of art reviews, feature stories and art fair coverage. All published by Hamptons Art Hub this year, readers selected stories revealing art exhibited in The Hamptons / East End, New York City and Miami for this year's top 15. After checking out the list, feel free read the stories that drew the most attention. There's plenty of enjoyment to be had whether discovering the stories for the first time or in a repeat visit. The East End’s largest and most elaborate art fair has descended for the second year onto the grounds of Nova’s Ark Project on Millstone Road in Water Mill. This fifth installment of Art Southampton is sponsored and arranged by the powers behind the larger Art Miami, a fair whose stature is second only to Art Basel Miami Beach, and they bring their seamless organization and clout to gather top providers of visual culture under one tent for five days. This year’s 2016 edition of the fair began July 7, 2016 with a mobbed VIP preview party, benefiting both the Parrish Art Museum in Water Mill and Southampton Hospital. One for the mind and spirit and one for the body. “solo four” by Monroe, 2015. Elisa Turner picks her five favorites at the art fair centerpiece of Miami Art Fair Week with each a "...joy and privilege to behold, if you love art for art's sake as this critic does, whether or not the price allows for the addition to your collection. “Temple of the Word” by Leonora Carrington, 1954. Oil and gold leaf on canvas. Exhibiting with Mary-Anne Martin Fine Art, Booth D2. Image courtesy of Mary-Anne Martin Fine Art. Will Barnet's solo exhibition at Alexandre Gallery in New York City is part of a trend spotlighting the work of artists who traveled through and were affected by the same cultural influences that spawned and fed the AbEx movement. Taking a closer look at Will Barnet’s relationship to AbEx, which is the subtext of the Alexandre exhibition, is both timely and historically significant and helps fill in some of the blanks around Abstract Expressionism and 1950s mainstream painters of the New York School. "Untitled" by Will Barnet, c. 1954-59. Mixed media on paper, 6 1/2 x 4 3/4 inches. Artists Kevin Wixted and Ro Lohin share life harmoniously as husband and wife but when it comes to art making, the pair are at almost aesthetic polar opposites. He meticulously and slowly spreads buttery textures layer upon layer to build his geometric work; she drops a stretched canvas on the floor and flicks tiny drops of paint repeatedly to conjure the silhouettes she sees in their garden in East Marion on Long Island’s North Fork. Contemporary abstract paintings exhibited by the pair at South Street Gallery in Greenport Village on the North Fork receive an extra layer of reveal when the artists discuss the process of making their work. The talk and the art on view are considered by Charles A. Riley II. "Red Wheelbarrow I" by Ro Lohin, 2015. Oil on canvas, 14 x 16 inches. Lee Krasner and her art are far from obscure. Nonetheless, the current survey at the Robert Miller Gallery reveals a continuity in her process that is often missing in other shows and presents surprises for those who might feel they know her historic place in the renowned circle of Abstract Expressionists. "Vigil" by Lee Krasner, 1960. Oil on canvas, 88 3/4 x 70 inches. © Pollock-Krasner Foundation / Artists Rights Society (ARS), New York. Courtesy Robert Miller Gallery. People in exotic garb caught in unusual situations embracing strange objects are the mainstay of Pamela Wilson’s art. Think harlequins, taxidermy geese, clown-white faces, fur stoles, flowing gowns, dolls and oversize striped lollipops and the picture will start to form. Frequently featuring only a solitary figure, combine these elements with a heady mix of steampunk, the macabre and a twist of unexpected lightheartedness and the journey to explore the complex worlds in the paintings of Pamela Wilson can begin. A series of Pamela Wilson’s latest paintings make up the exhibition “The Sweetest Poison” at RJD Gallery in Sag Harbor reveals a new direction for the painter, with glitter, gold leaf and monochromatic veils incorporated for the first time to cloak the artist’s figurative magical realism. "The Incurious Came Pirouetting" by Pamela Wilson, 2016. Oil and 24K gold leaf on canvas on birch panel, 24 × 20 inches. Courtesy RJD Gallery. Christie’s “Untitled: Insider Art Show” is the auction house’s annual sale of works by employees. Since the show's inception 17 years ago, the summertime rite in New York City has been a point of pride at the world-renowned auction house. This year's exhibition presents 45 works by art handlers, department experts, and other behind-the-scenes denizens of the company who help make the prime time art auctions happen when they're not making their own art. "One More Stripe" by Aaron Young, 2016. Acrylic and collage on canvas, 52 x 38 inches. Courtesy of Christie's. Redemption can be jubilant, as the resonant solo show devoted to Charlotte Park (1918-2010) at Berry Campbell gallery in Chelsea proves. 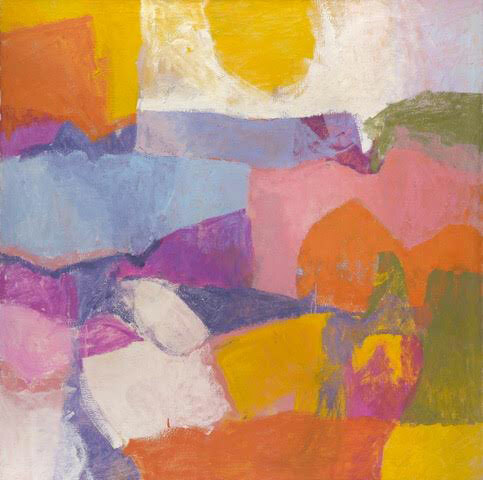 After decades in the shadow of her husband, James Brooks, Park steps forward from the Abstract Expressionist chorus and unleashes her singular strong voice, hitting all the top notes of color, gesture and scale with confident power. "Untitled" by Charlotte Park, c. 1963. Oil on canvas, 50 x 50 inches. A self-described “second wave” abstractionist, Vincent Longo was a regular at the Eighth Street Club and the Cedar Tavern, where he shared in the talking and drinking that took place with some of America’s most revered Abstraction Expressionists. The painter who now makes his home in The Hamptons offers his views on abstraction and “representational” painting, painting process, color, and starting with one thing and finding another in a conversation with art critic and artist Janet Goleas. "Casement" by Vincent Longo, 2006. Acrylic on wood, 12 x 9 inches. The blessed freedom from gravity, heat, cares and constraints conferred by the summer’s first dive into the aquamarine purity of a pool is celebrated by Lorraine Shemesh in the refreshing solo exhibition, “Inside Out,” at Gerald Peters Gallery on the Upper East Side of New York City. "Surrender" by Lorraine Shemesh, 2015. Oil on canvas, 58 x 70 inches. The chance to experience telling distinctions from their male counterparts when women paint other women is being offered at RJD Gallery in Sag Harbor as part of the gallery's fourth annual "Women Painting Women: Our Collective Conscience." The exhibition features paintings by 17 artists based nationally and internationally selected from an open call that drew hundreds of submissions from around the world. The show also includes gallery artists who embark on the same process. Following an acknowledged master through his earliest forays into finding a style is like watching live over his shoulder in the studio. This process of tracking a highly regarded artist’s early development is only one of the pleasures to be found in “Richard Diebenkorn: Early Color Abstractions 1949-1955,” a lovingly focused exhibition of 30 early works on paper at Van Doren Waxter on East 73rd Street in New York City. "Untitled" by Richard Diebenkorn, c. 1952-53. Gouache on paper, 17 x 14 inches. Catalogue raisonné no. 1190. Representing the artist’s first U.S. museum solo exhibition in 15 years, "Peter Beard: Last Word From Paradise" presents more than 50 multi-layered collages, drawings, photographs, and diaries from the 1960s to the present, some on public view for the first time. The show at Guild Hall in East Hampton includes the artist’s iconic work from Africa that chronicles the change in the landscape from a time richly populated by elephants, rhinos, and crocodiles, to what remains today. Also featured are never-before exhibited Montauk portraits of his home, family, and friends including Mick Jagger, Andy Warhol, Jacqueline Onassis, and Lee Radziwill. "I'll Write Whenever I Can…" by Peter Beard, 1965/2004. Gelatin silver print with gelatin silver collage, animal blood, and rag, 50 1/4 x 88 1/4 inches. ©Peter Beard, Courtesy of Peter Beard Studio. One when one encounters a painting with no paint, the question still arises, why would an individual—assuming that individual has an affinity for painting itself—abandon traditional painting methods and assume the more sculptural disciplines of casting, carving or modeling? “Physical Painting” at SUNY Purchase in Westchester, NY explores the issue with paintings made without paint to explore artist expression that shuns traditional materials. “Black Eye, 2014” BY Hilary Harnischfeger. Paper, hydro-stone,pigment, ink, amethyst, mica. Courtesy of the artist and Rachel Uffner Gallery. 1. "RAMONES: Arturo Vega and the Making of the Logo Heard Round the World" by Sandra Hale Schulman. Sandra Hale Schulman presents an insider view on Arturo Vega's foray into graphic design for the Ramones and his making of the famous round logo for the punk rock band on the occasion of their inclusion in the Queens Museum's exhibition "Hey! Ho! Let's Go: Ramones and the Birth of Punk." Looking for more Year in Review stories? Visit "Staff Picks: Best Exhibitions on the East End in 2016" and "Best Writing at Hamptons Art Hub in 2016."